Hello friends, Samm Bennett here. 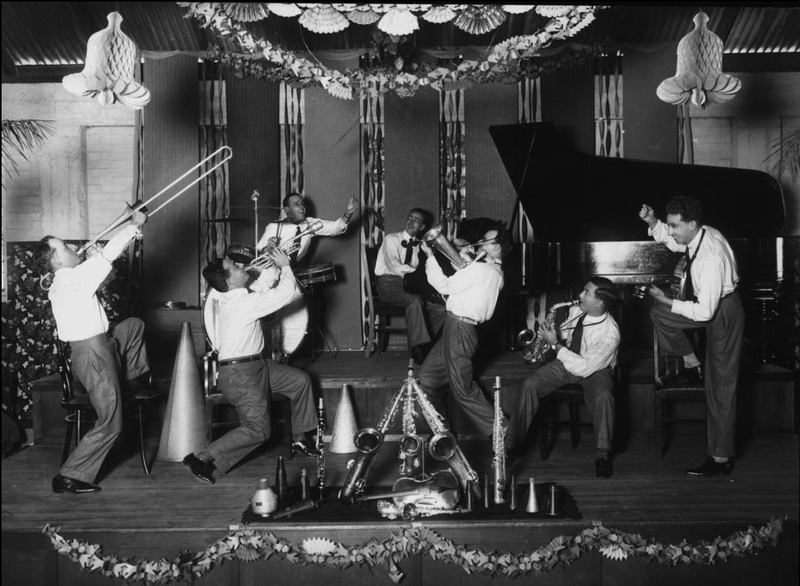 This is a collection I've put together of photos featuring old jazz bands and jug bands. They're mostly American bands, of course, but there are some here from some other countries as well. New images are constantly being added, to the TOP of this page, so please visit again sometime to view the latest. Hope you enjoy! 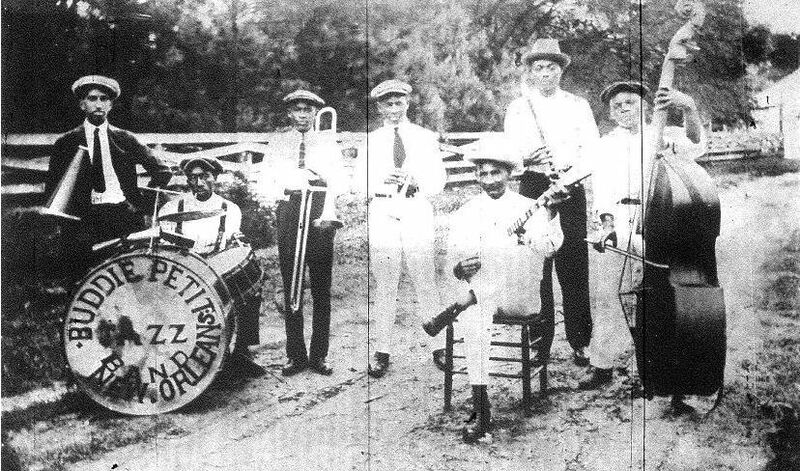 The Original Dixieland Jazz Band, 1917. They had lots of publicity shots made, and there's more of these guys later in this gallery. 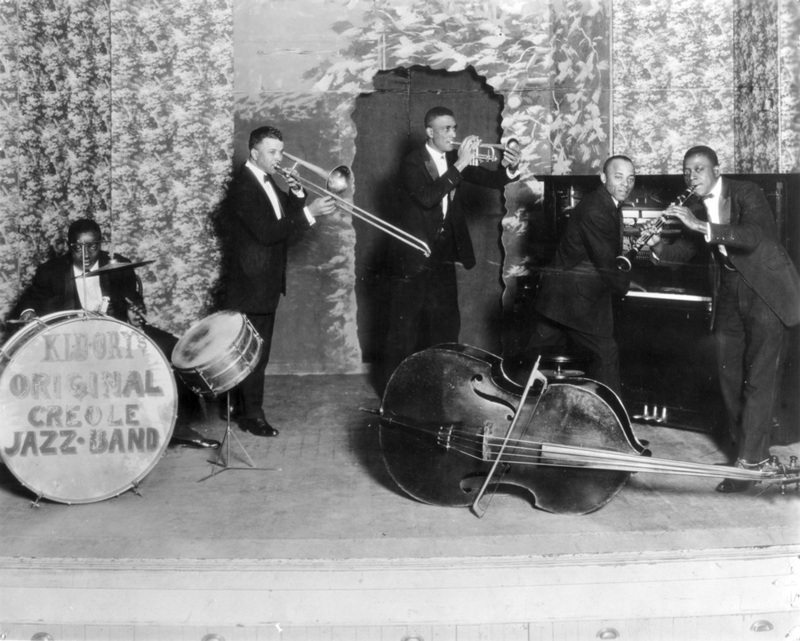 Earl Fuller's Famous Jazz Band. What is it with clarinet players, huh? They do the damndest things. This is the epitome, the apex. Surely one of the greatest band photos in history. Perfection. See below for less retouched version. 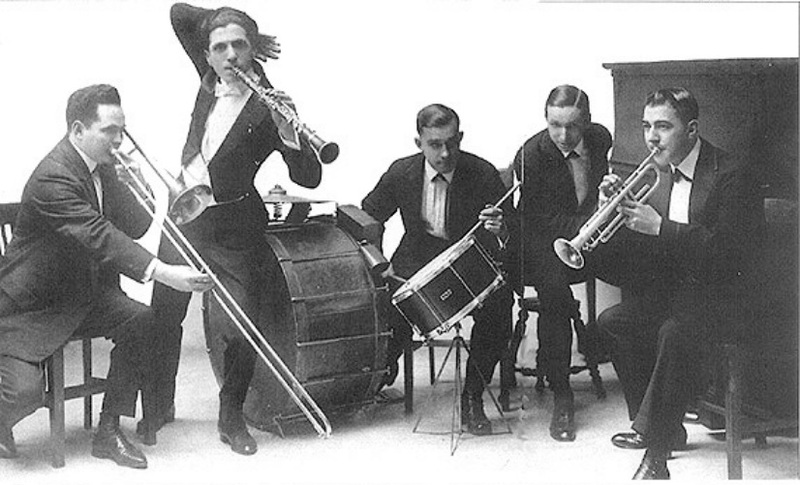 The Don Redmond band. This photo sold on eBay for $300. Unusual bird's eye view shot, very nice! This has got to be one of the best "action" posed shots ever. 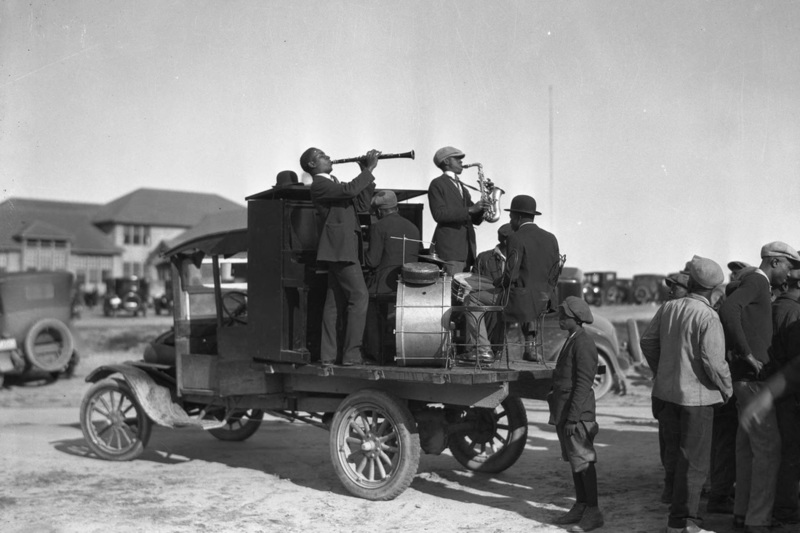 And check out what the clarinet player is doing. Boy, I tell ya, the clarinet players were always the zaniest. When I first posted this, I asked here in the caption if anyone had any info on this band. 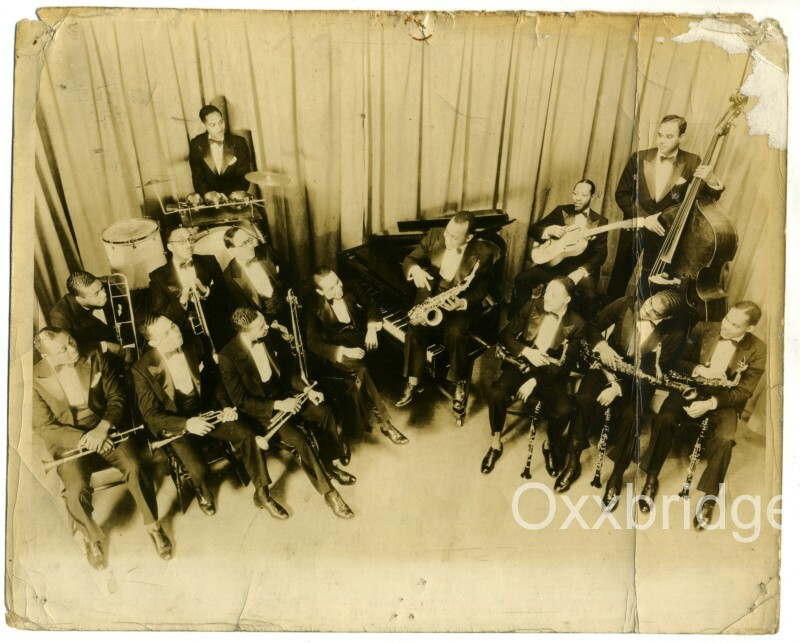 I received this reply: "I think that it could be Andy Preer's orchestra, or The Cotton Club Orchestra. Jimmy Smith is at the tuba, R.Q. 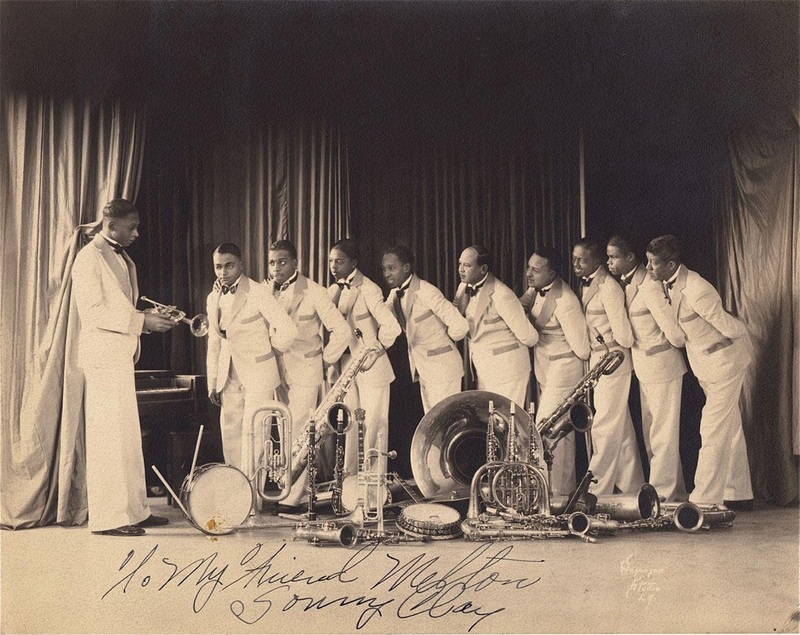 Dickerson at the trumpet, Leroy Maxey on drums, Andy Brown on clarinet; EB De Priest Wheeler on trombone... All of them belonged to this orchestra. Not sure about Andy Preer on violin." 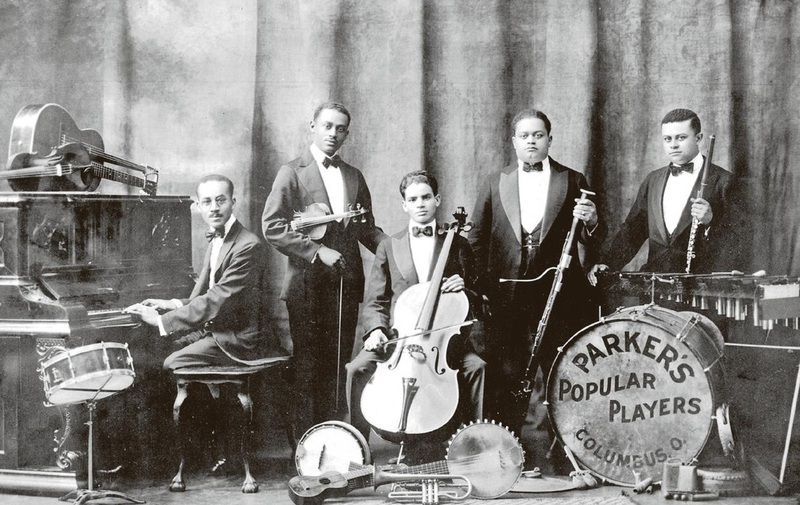 That info was kindly provided by Jean-François Pitet, who has his own site devoted to Cab Calloway, check it out HERE. 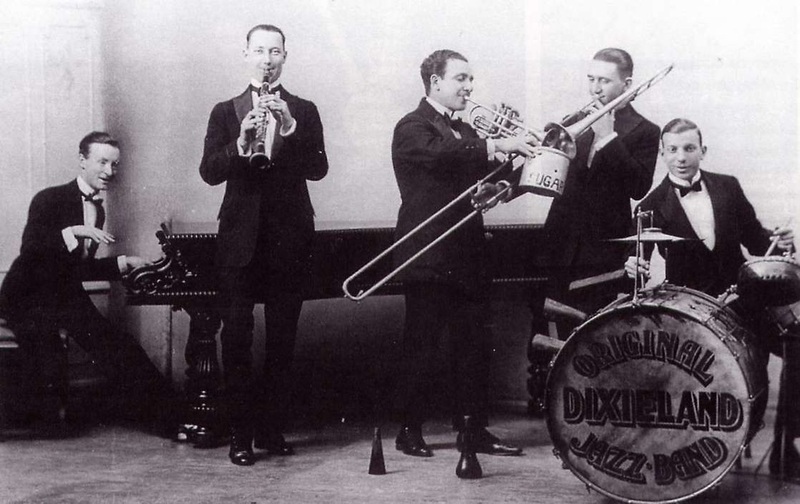 Once again, the Original Dixieland Jazz Band. What are they doing with that sugar tin? 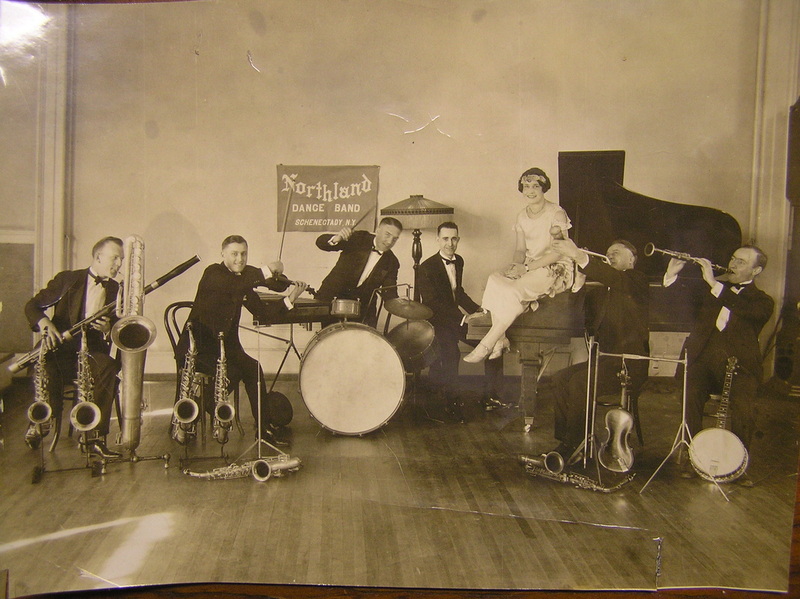 This photo was kindly sent to me by Marc Rosenberg, whose grandfather was the drummer for the Northland Dance Band! 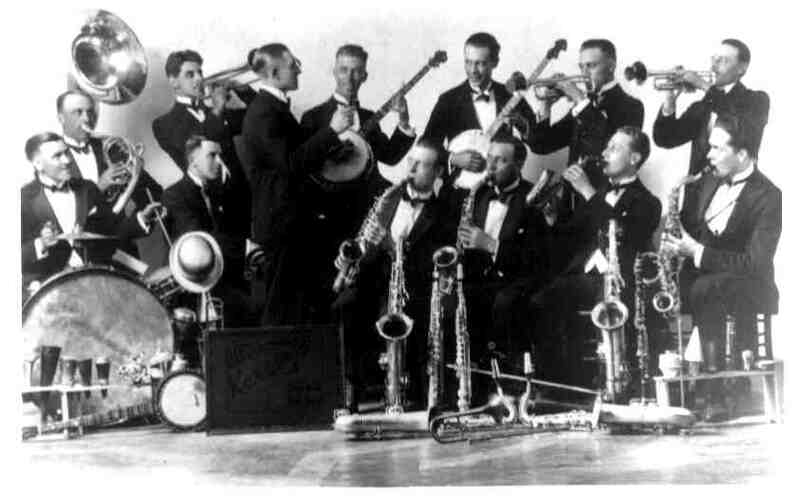 Note: the fellow at left with the large collection of saxophones is playing a bassoon, rather unusual! OK, now, first, this is just the most wonderful picture ever. 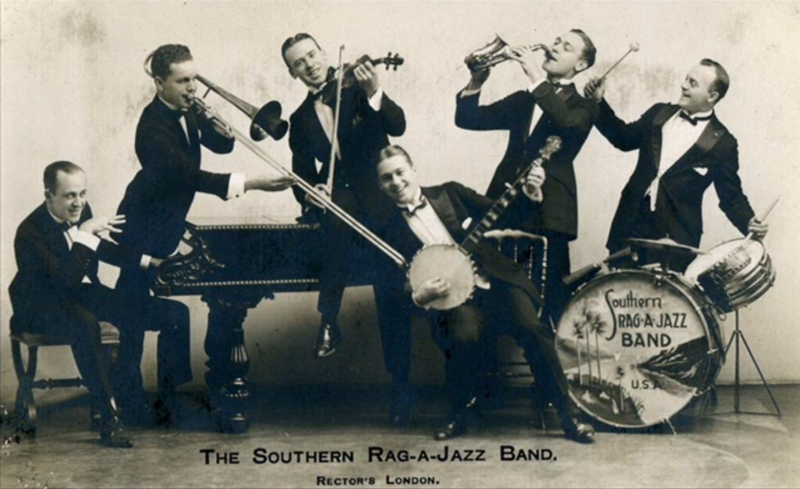 Second, they were called the Razzy Dazzy Spasm Band, which is just unbeatable and fabulous as all get-out. 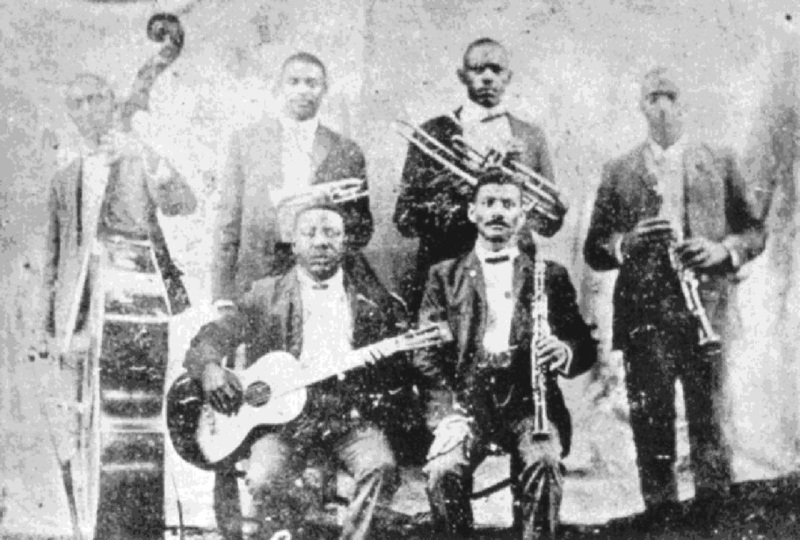 They played in the streets of Storyville in the 1890s and early 1900s. Read about 'em here. Here's a lively bunch from Brisbane, Australia. 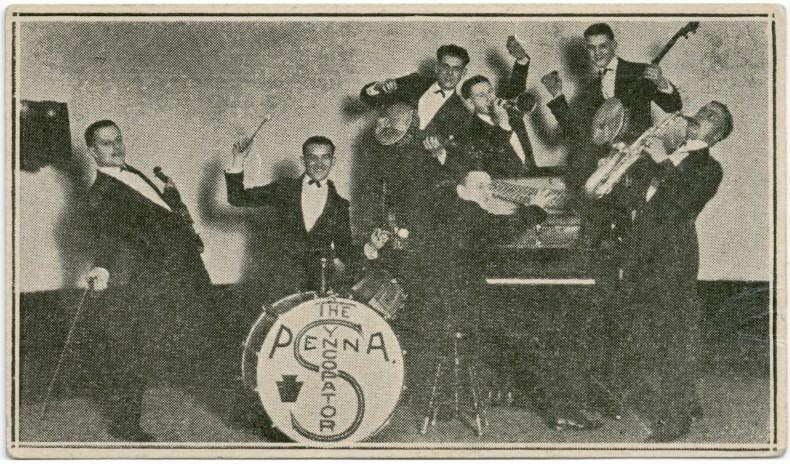 Proof positive that syncopation was at least acknowledged as a concept in Pennsylvania. A rare "mixed" band. A rather odd effect, with the inset faces (mostly so somber!) and the four count 'em FOUR accordions! These fellows were leaning toward agreement. Can you teach me to... swaaaaaang? 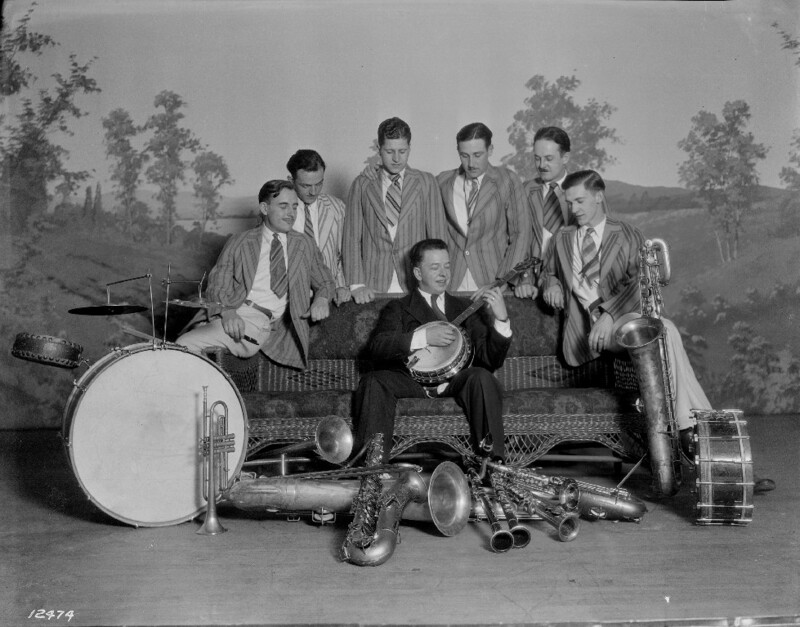 Art Hickman on drums, and his Orchestra, 1919. 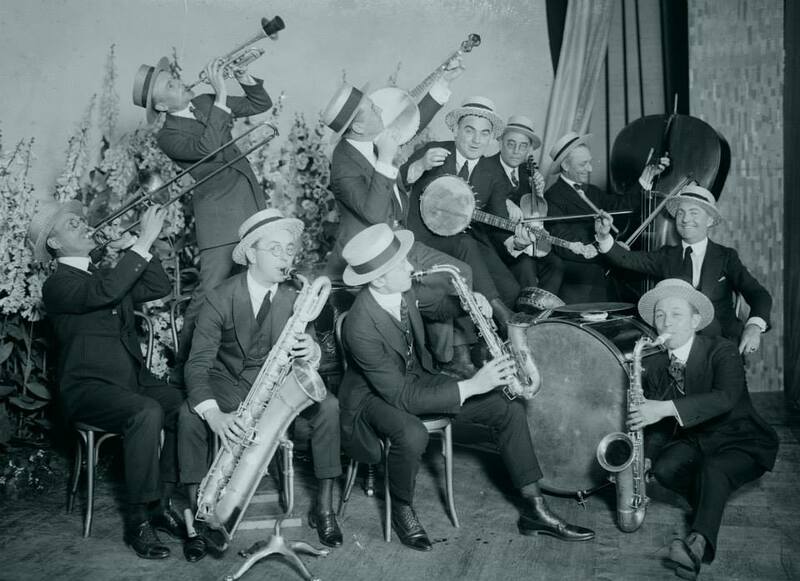 The sax player kneeling down on the right hand side is Bert Ralton, who went on to lead a band of his own at the Savoy Hotel in London, 1921-1923 Kind thanks to Nick Dellow for providing this information. 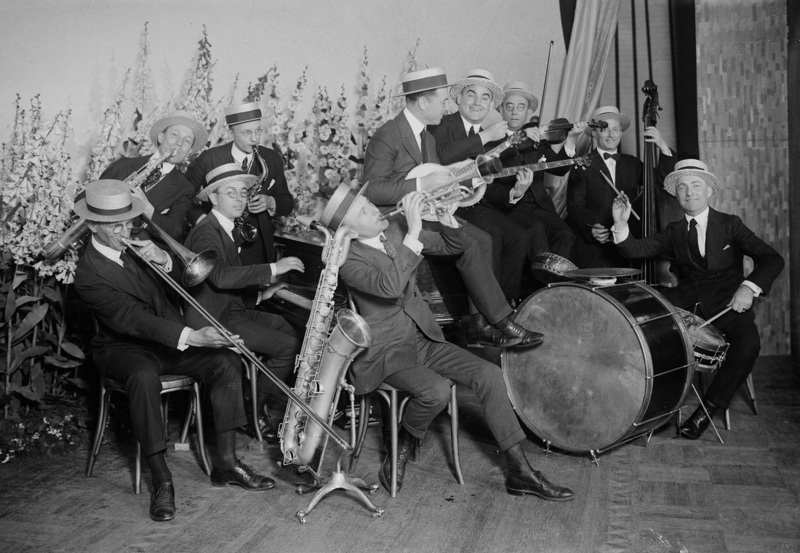 Note the upside down bass fiddle, and one of the banjo players with his banjo in violin position. Har har. The photo below, obviously from the same session, gives us a better view of Hickman's drums. 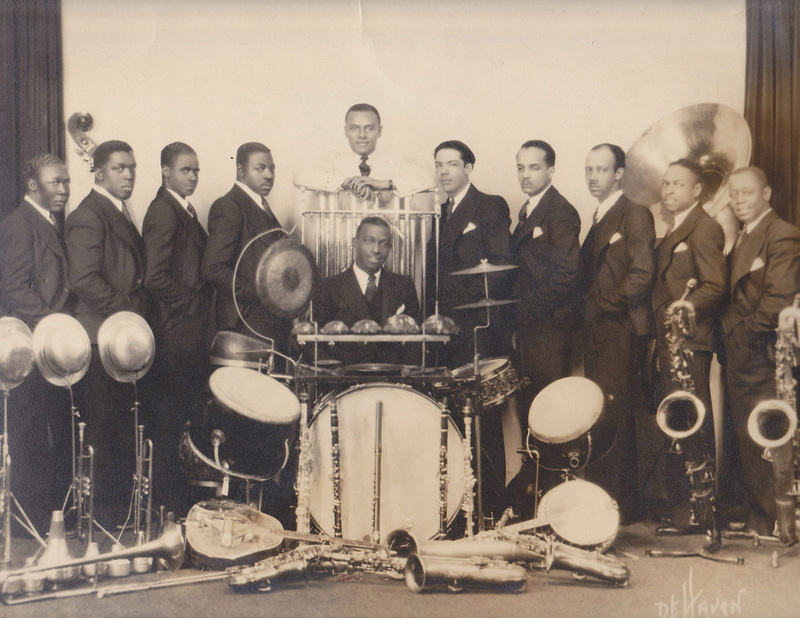 Yet another King Oliver band shot, this one from 1931 (via), and much more sedate than the sidewalk promo shot from 10 years earlier. Check the double-neck acoustic guitar! Unusual! Couple of nice big Chinese tack-head tom toms the drummer is sporting on that drum kit, along with the row of Chinese temple blocks and "trap" table mounted atop the bass drum. For much more on the drum sets of this time, see my Vintage Drum Kits page, where you'll find a wealth of info. Hey, watch the banjo head with that trombone, buddy! Once again, it's King Oliver! 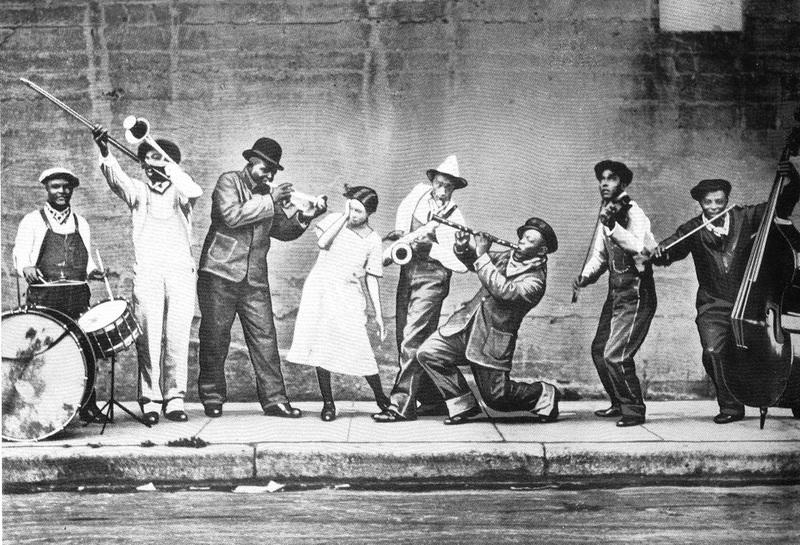 The most photographed man in early jazz! 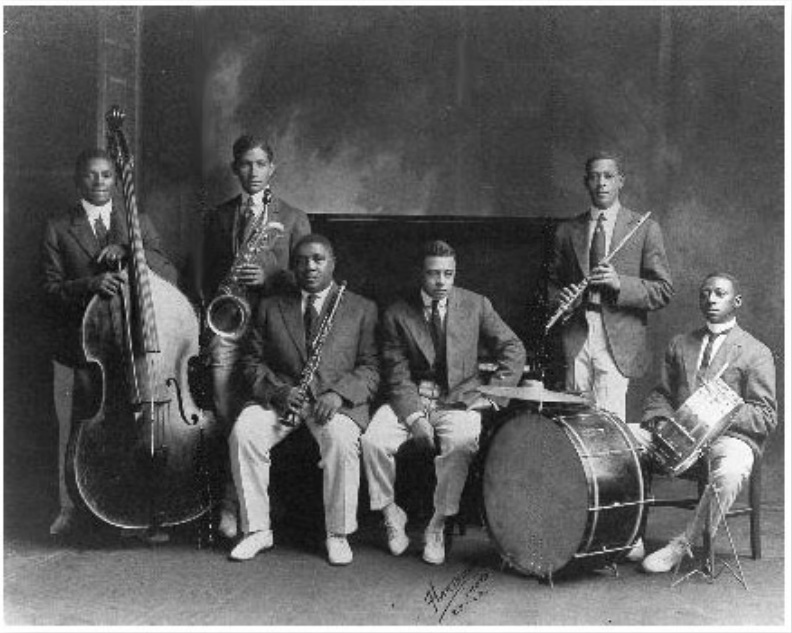 That's none other than Louis Armstrong behind the drums! Mike Denzi's Red Devils. Rather unusual painting on that bass drum head. Here's another outfit from the great state of Wisconsin. A jazz hotbed! 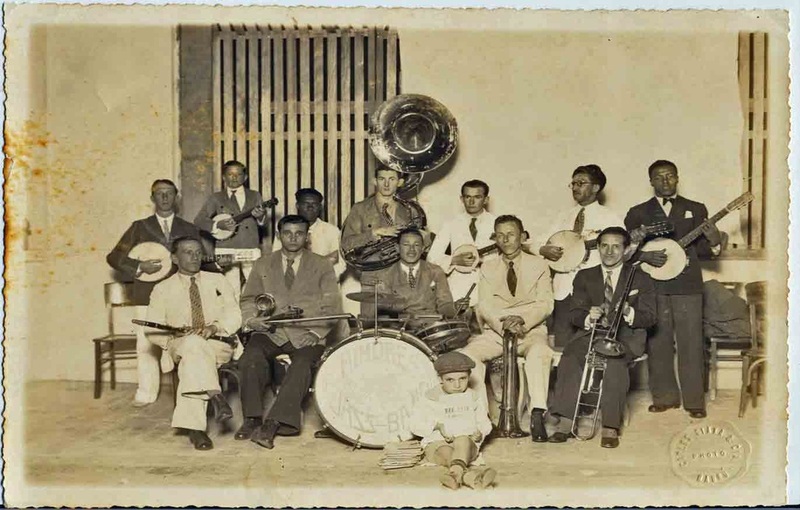 Don't know why they thought it a good idea to keep that odd frame structure there in the photo: maybe that was a Wisconsin thing... Interestingly, one rarely sees a Chinese tack-head tom tom mounted on the dead center of a bass drum. They are almost always mounted to one side or the other. This guy had his own system. 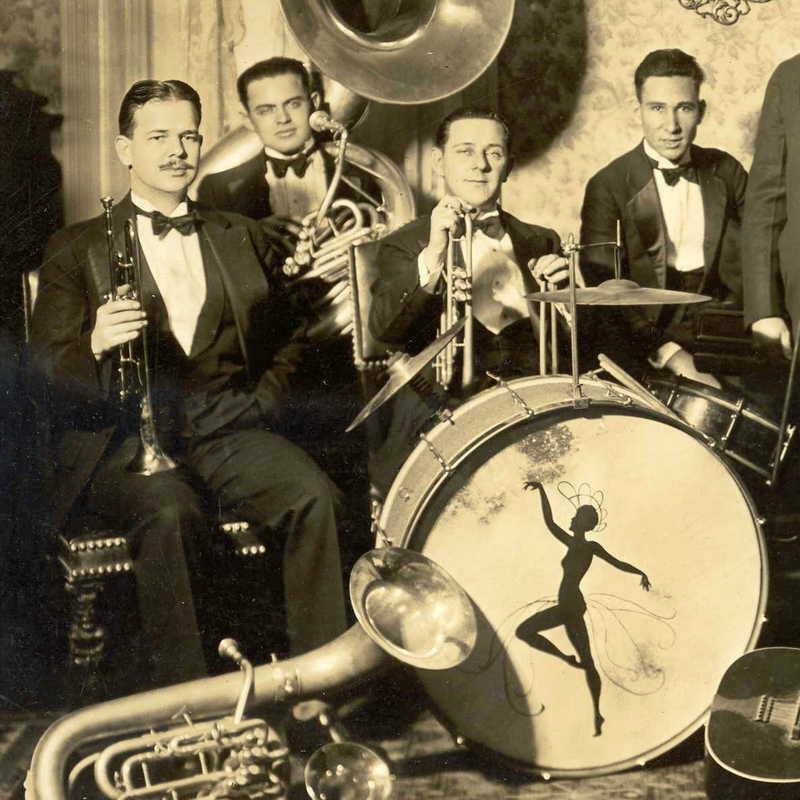 Much, much more on the drum kits of that era at my vintage drum sets of the 20s and 30s page. Well, OK, then, what say we get the hell outta Michigan and mosey on down to Memphis, huh? Sound good? Alright! Jug band time! Some info on Walter Page's Blue Devils here. Albert Kersey's Solo Band. All eyes on Albert! 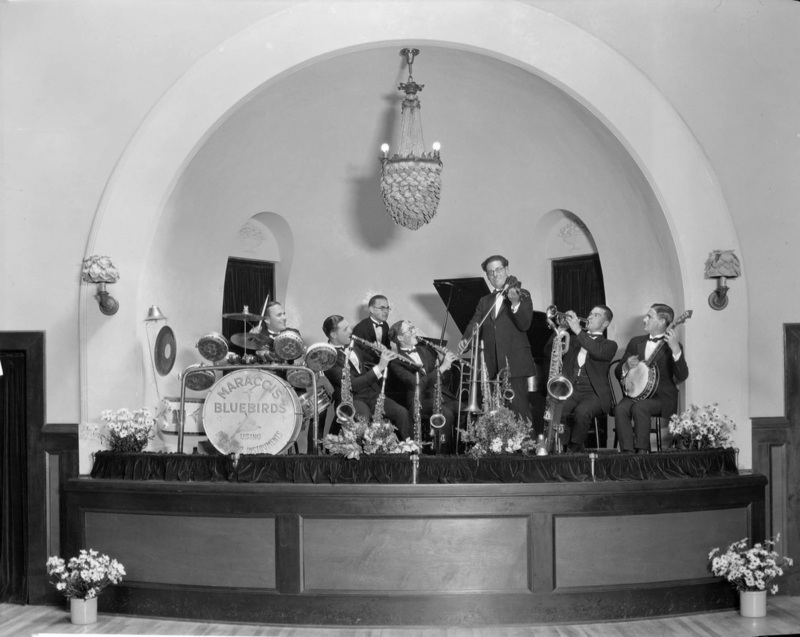 Note how the drummer has removed the Chinese tom tom from the kit and placed it to the side of the bass drum for the photo. 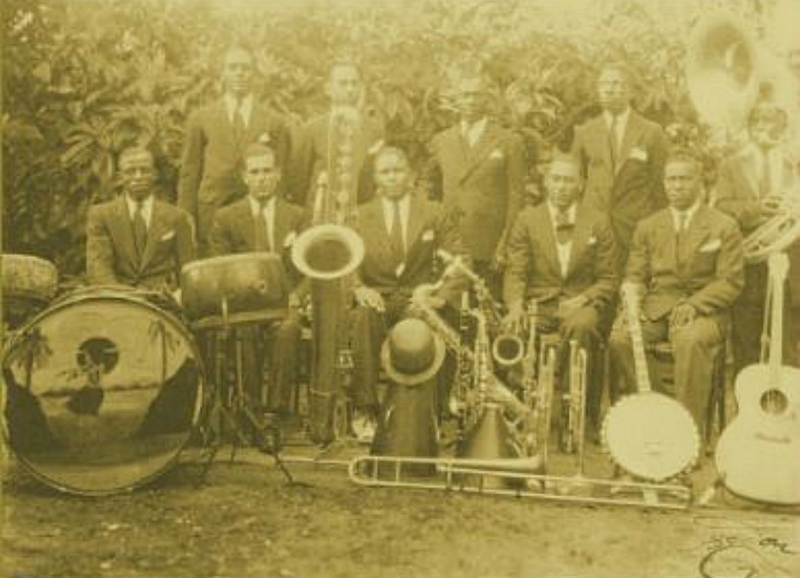 The Fletcher Henderson Band, 1925. The bass drum, with its lovely, characteristic landscape painting on the front head, still exists, in the collection of the Percussive Arts Society. There's a color photograph of it if you care to view, at my Vintage Drum Kits gallery. Best. Band. Name. EVER. After the Scrap Iron Jazzerinos, and the Razzy Dazzy Spasm Band, that is. Make no mistake, these were the ORIGINAL revelers. There was apparently no revelry before 1938. That's all for now! More coming soon!